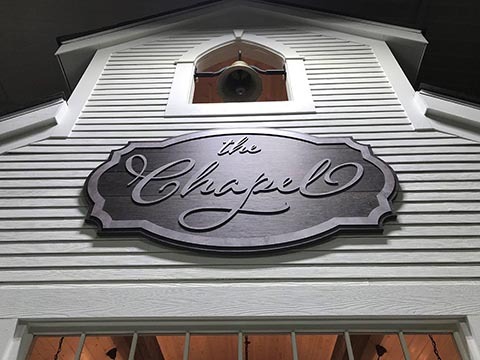 Scranton, Pa. – Vycom Corp., a market-leading manufacturer of highly innovative plastic sheet products, is pleased to announce a new Celtec® Woodgrain premium signboard material that adds texture for creating durable, wood looking signage applications. This material offers a more durable, lower maintenance solution than wood for signage and display applications requiring a wood-like surface. Celtec Woodgrain material will make its debut in the Vycom booth 4853 at the ISA Sign Expo 2019, April 24-26, in Las Vegas. Woodgrain material is a textured substrate that can be used to create signage and structures, offering a durable alternative to wood and an aesthetically pleasing alternative to replica wood surfaces. It is more weather, impact, and insect resistant than wood, and will not warp, cut or split. It is lighter than wood, reducing shipping and material handling costs. It offers texture and durability not available in painted or vinyl-covered surfaces. Woodgrain materials stand up to heavy use and weather, reducing replacement costs and extending the life of the signage. Woodgrain is available with a white finish in 4- by 8-foot sheets in 12mm (05.”), 19mm (0.75”) and 25mm (1”) standard thicknesses. Woodgrain in 10mm thickness is available for quantity orders. For more information on this new offering, please contact Vycom at signgraphics@vycomplastics.com.